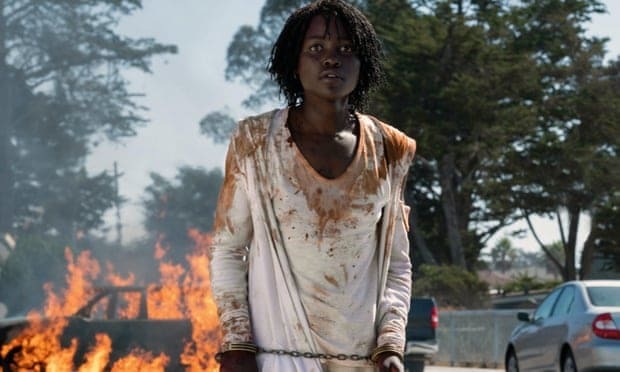 Home invasion is among the scariest archetypes in horror, and Jordan Peele’s Usis the latest in a long tradition of twisted stories that tap into our deepest fears. What’s brilliant about Usis that it subverts what we know about the genre to create a delirious, doppelganger nightmare. This a brash and chilling movie with subtexts in abundance and much like Peele’s debut feature Get Out, it carries a political message. The focus is on the Wilson family. Lupita Nyong’o plays Adelaide, who with her husband Gabe (Winston Duke), take their kids Zora (Shahadi Wright Joseph) and Jason (Evan Alex) for a relaxing vacation to Santa Cruz. During their stay at the family beach house, four sinister strangers dressed in red jumpsuits arrive on their driveway. These people look exactly like the Wilsons, but their behaviour is a stark contrast; the invaders are demented, crazed monsters hell-bent on terrorising the family. Peel once again shows he’s a master of suspense and adept at creating the kind of horror that keeps viewers squirming in their seats. Us is tense and unnerving, right from the creepy opening scene yet it still manages to pack in great comedy. It also has a lot to say about duality, class and identity, but these social themes never overwhelm the main story. The scares, characters and the mounting sense of dread take centre stage. At no point does Us ever rest on its laurels as every scene ramps the terror up a notch, with the Wilsons fighting for survival. Nyong’o is the standout performance. In her dual role as Adelaide and Red, she’s both poignant and down-right disturbing. It’s through her characters that the movie reveals itself as a dark study of inner conflicts, exploring the age-old concept that “we are our own worst enemy”. The rest of the cast is exceptional too, including the kids, who portray their characters with charisma and style. Every family member has a scene-stealing moment and they’re all hugely relatable, so as the viewer, you care deeply for the family’s struggle. While Us lacks the power and impact of Get Out, it’s a stunning horror movie that warrants repeat viewings. There are all kinds of complex ideas hidden in the film’s narrative, which opens up in unexpected ways. Us is a real cinematic treat for anyone who loves movies.